Complete financial statement and valuation modeling training the way it's done on the job. Includes lifetime access to online courses and Excel model templates. Hone your skills in modeling, data analysis and presentation, forecasting and budgeting. For FP&A, corporate finance and business development professionals. Learn how Excel VBA can reduce time-consuming spreadsheet work to the click of a button. Write your own VBA code form scratch. No prior experience needed! 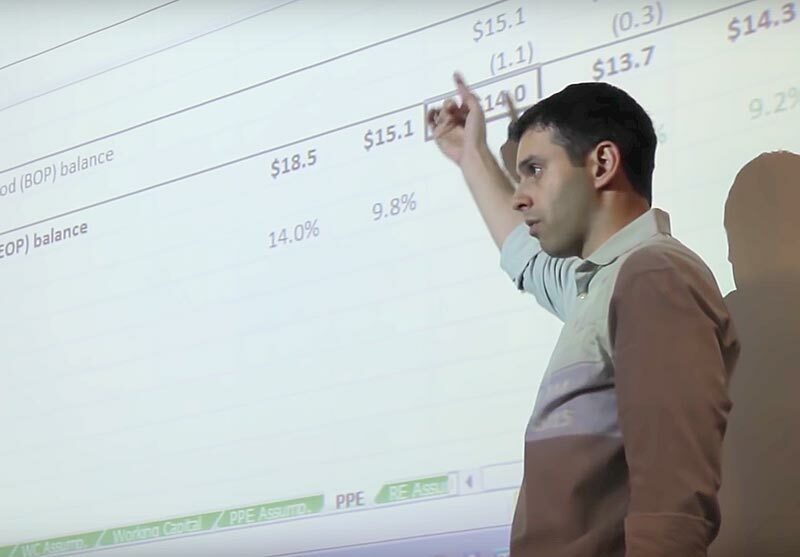 Learn practical financial and valuation modeling skills required to analyze complex projects. 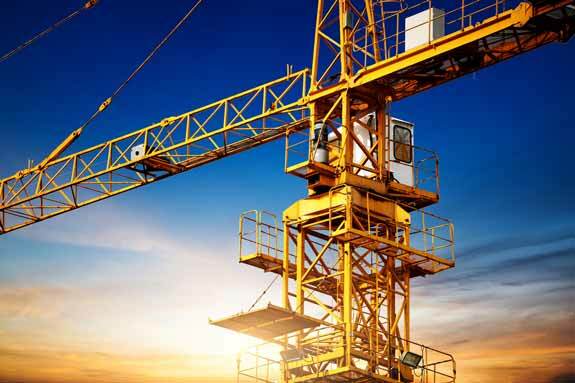 Modeling for infrastructure, renewable energy projects and more. "Extremely well organized and relevant for a broad spectrum of financial professionals. I've taken Training The Street and this was much better organized and presented." "The instruction and exercises provided were highly informative and relevant to my daily job functions. This was by far the most impressive instruction and the most comprehensive module-based curriculum I have ever experienced." "Very helpful, comprehensive review of critical financial principles and tools. Wealth of additional resources is valuable. Highly professional and comprehensive[compared to other training programs]." "It covers all the basics and provides a good base for finance and acconting knowledge. Model templates are much better and clearer." "Great way of condensing a lot of important material and presenting it in a very easily digestible way." "It gave me a great insgiht into the world of modleing. Would recommend it to anyone with an interest in finance." "Great for foundational skills and access to online content is invaluable." "Great deep dive into FP&A relevant excel techniques. Much better [than other training programs]. Great hands on examples." "Very valuable course for understanding fundamental skills that are needed in the investment industry." "I believe it gives a good foundation on how to begin modeling and the life time training material is a big plus. This training program provides many more tools and is very hands on [compared to other training programs]." "Highly relevant to my role and my company. This training was better [than other programs] by a huge margin. Hahn did a fabulous job, I can't wait to go back and apply what I learned." "Great course for anyone that needs to forecast in their job." "VBA is a great tool that allows us to expand our Excel efficacy." "This training is very relevant to my field and all the topics were broken down in a helpful way. I prefer this training over some of the other financial modeling boot camps. It’s very informative with better instructors." "Clear delivery of important valuation and FSM materials at just the right level of detail"
"The online materials are excellent and will be beneficial in the future. The classroom experience is invaluable." "Great overall presentation on valuations and different methods for both buy and sell perspectives. Much more extensive than previous trainings I've attended." "Very detailed, great materials, and outside classroom resources. Knowledgeable instructor. Wall Street Prep is a lot more industry specific with real-world scenarios and current (compared to other trainings)." "The material and layout of the examples are easy to follow. This training provides a real life situations and practical tools to use. Very good and detailed step by step process." "Very good value for money compared with other service providers. Materials are comprehensive and high quality." "Very applicable to finance and excel is important to know. Instructor was incredible!! Very good at explaining topics and very easy to understand." "Helped make harder concepts easier to comprehend." "Great overall content and structure. The instructor was very knowledgeable about all topics covered." "Very rich, relevant, and practical approach. The instructor transferred knowledge very well through real life examples. Exceeded my expectations!" "It was really informative and generally pretty broad, so easily applicable for most positions." "Extremely informative and helpful for preparing me for an internship in PE." "I think the materials alone are worth the price and the instruction is fantastic." "The presenters are extremely knowledgeable and answered all questions accurately. There is significant value in having the excel files and base models for practice in real world." "Excellent to have source of knowledge to extract info from and walk through hard to grasp concepts in an understandable way." "Much better than other programs. A lot clearer and easier to follow with the prepared excel templates." "The instructor is incredibly knowledgeable on the subject matter and explains everything in a lucid manner. The modeling template exercises are clearly laid out which was incredibly helpful." "Feels more accelerated than typical training programs. Great course overall." "Great exposure to financial modeling. Patient and knowledgeable instructor. Worthwhile! I learned so much!" "Helps you understand what areas you need to focus on to be successful in the field." "Came in with very little knowledge of accounting/financial modeling and now feel prepared with a base knowledge going into work."" "Class was fast paced, but the information was presented in a clear/concise matter and the worksheets were helpful." "It was a great opportunity to build my skills. Mike was great, he made the topics easy to understand and offered great stories and insights." "Thorough and applicable. Great instructor!" "Silab was an amazing teacher! I learned a lot." "Presenter was extremely knowledgeable, communicated well, and was very engaging." "A very detailed comprehensive training seminar perfect for someone who wants to understand M&A valuation better." "I would definitely recommend this seminar! 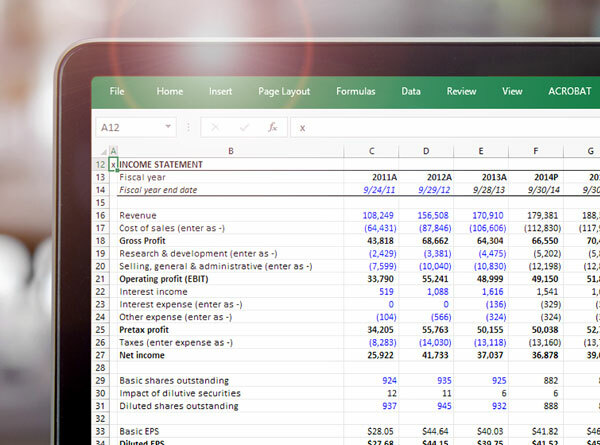 Excellent overview of accounting principles and how to build financial statements in Excel." "Very good and important Excel tricks." "Mike was an engaging teacher. Very high marks." "I learned a lot of valuable info. Our instructor was great at simplifying topics for us to understand and was very willing to help." "Great primer on financial modeling. Does FSM, DCF, M&A and a good job at providing info on that." "Great foundation to go and build on." "Mike was one of the best professors I ever had. Super helpful and to the point." "Hands on modeling in Excel made this very helpful. Instructor was also very good." "Mike was an excellent teacher and has an encyclopedic understand of the material." "Great introduction to material. Mike is a really great teacher." "Great course if you do not have a MBA or finance background." "Real world examples that help with taking the models and changing them to work with the company you work for." "Provided in-depth information on financial modeling and valuation processes." "Comprehensive coverage on financial modeling. I like the M&A session since I don’t have experience on it." "It is very useful for anyone in Oil and Gas/Energy. I’ve taken a similar course with IBI and this is much better; more hands-on and easier to follow along with the instructor." "Very informative, good material, and good instructor. Provides the right blend of theory and hands-on material." "Good demo of O&G models." "This has been an excellent complement to what I learn at UT Austin." "Great overview and case studies." "Great overview display of industry knowledge and analytical techniques from instructor." "Excellent models provided. The trainer and training material are far more explanative than others provided by another program." "It was more relevant to my job." "Massive amount of information within four days, which will help to improve the financial modeling and analytical skills. I consider this training as the top of the list of my other training lists I’ve been through." "I would recommend this training because its very informative. Useful for most people in finance and Excel users." "I would recommend it to anyone with at least a few months on the job and working in an investment related field." "Very relevant to asset management." "Overall great. Good discussion on P/E and ROE relative work." "Great material, straight to the point." "It’s very helpful. All topics covered are excellent." "Provides excellent training for modeling." "It’s a very valuable course." "Excellent presenter really learned a lot." "Very helpful for making financial statements." "Great material was covered, especially Excel formulas." "All companies should require this training. It is practical and can be used immediately in any organization." "We covered a lot! I will be able to apply the material we learned right way in my consulting practice." "I would recommend it, be very relatable to many of my colleagues. Very good, great class." "This was a great refresher for those of us that have been FP&A for a while. Will recommend to junior staff with about two-year experience to grow their knowledge." "Great class, lots of relevant information. Carl is a very engaging presenter." "Excellent presentation quality, delivered in a very easy to grasp method. Spoke of relevant, real-life business applications of models and scenarios." "I enjoyed Carl’s energy. It made the days go by faster. The first day’s material was the most helpful for my day-to-day job. I also liked the hands-on aspect of the materials that I can continue to reference." "Covers stuff that otherwise doesn’t get attention." "Teacher is so friendly. I think the class is useful for people in my position level." "Carl is an excellent speaker and instructor—thank you! Great Excel knowledge." "Engaging instructor and very useful Excel tips and formulas introduced that I would not otherwise have known about." "Great examples and stories. Very knowledgeable instructor." "The training is very good at boosting Excel skills and making your Excel use more efficient." "I would recommend this because the in person training allows for interaction." "I definitely learned a lot and there are tons of resources to refer back to." "I will recommend for new hires starting in our department who need finance refresher course." "Very relevant and beneficial for those interested in finance. Good class, great instructor, lots of valuable information." "Enjoyed that the instructor used real life examples to get his points across." "Mike was a great teacher. He showed knowledge and was thorough and was always open to questions and helping out the students." "Awesome set of resources and explanations. I can see this being very useful for students and young professionals trying to go into investment banking." "Very dynamic—we covered a lot of topics that, at least in my company, would be huge if we implemented them." "Incredible! This course was great. Worth every second and dollar. Carl really knows what he’s doing—amazing." "Carl is articulate and well versed. He also provided many concrete examples." "Great view of what FP&A should be." "It’s an excellent training, would highly recommend." "Good application practice. Good instructor’s knowledge and ability to teach." "Thought it was very well done." "Very practical, engaging, and useful. Thanks Carl. I enjoyed the training and can’t wait to apply a lot of what I learned at work." "From an FP&A perspective this is the most beneficial course I have taken that I can apply directly with my job." "Great blend of corporate finance/accounting/Excel and application to actual case studies. Silab is great—wealth of knowledge and kept a balanced pace throughout the course." "Instructor is very knowledgeable and brings ‘real-world’ investment banking experience to the session." "Great instructor and excellent content that will serve as an important resource in my current role. One of the best professional development courses I have ever taken." "The course is complete and practical." "Great to refresh concepts and stay current. Silab is extremely knowledgeable, able to cover a breadth of accounting and modeling concepts with ease." "Believe this is a great course, very clear and effectively taught. Already recommended my whole team to come!" "Very beneficial course. Good pace and information, the templates and online tools will be very helpful." "For a three-day course, very approachable and informative." "Highly qualified instructor, good course workbooks, good presentation, overall interactive experience." "Covers a lot and is very informative." "The training is hands-on and provides a broad overview of financial modeling." "It is beneficial to getting more comfortable with modeling." "Provides tools needed for basic financial model." "Good practical application provided. Like step-by-step nature of online courses, very helpful for beginners." "Great course. Silab is a great instructor!" "It was extremely thorough and explained well." "Silab was an excellent instructor!" "Great crash course on key financial modeling and analysis techniques." "Great overview of a lot of information." "Top notch training with top notch bankers." "The examples used and accounting exercises were very helpful." "Wealth of knowledge that is not easily found online." "Good for those who want to understand general ideas of modeling." "Hands-on, ready to deploy the knowledge right after the course." "Although I am still a college student, the information that I’ve gathered here surpasses anything I have learned in school. Due to this course I feel prepared to tackle and excel at any internship. This was my goal and it has been accomplished." "Extremely relevant to real-life work." "Great introduction as well as it truly dives into a myriad of concepts." "Despite occasionally struggling with unfamiliar concepts the models were all covered in depth. I will walk away with a solid foundation for further finance study." "I believe it is helpful to learning the skills needed." "Very helpful. Great instructor, very knowledgeable." "Very helpful information and applicable across industries." "Very good foundation for financing work and access to many useful online courses." "It is more personalized since the classes are smaller and the teacher is thorough." "Silab is very good about understanding what students are asking and why they are confused. His knowledge of Excel and the provided docs is impressive. His patience in answering questions was much appreciated." "Great snapshot and prac-app of info for professionals working in financial space." "It has helped with theoretical as well as hands-on understanding." "This training shows real life ways/practices on financial modeling." "Easy to understand very informative." "It teaches you great overall understanding of modeling and provides you with a lot of material to go through even after the course is over." "Silab was a great instructor who took the time to answer all questions." "Course instructor was excellent. He was very knowledgeable and thorough. I highly recommend this training to others." "Excellent versus Training the Street and Pillars of Wall Street." "In general, the course is a great blend of conceptional knowledge and practical training for someone entering finance, this would be especially helpful." "It was fantastic! Amazing instructor and very well prepared and approachable with clear presentation skills. Material is very clear and helpful!" "It is a solid introduction to highly relevant topics in industry and very applicable to finance/consulting practices." "The material provided is essential both now and as a point of reference for anyone in the valuation/advisory world." "Right mix of practical Excel Skills and conceptual framework, relevant/interesting case studies." "The training includes great information, presented in a useful format." "Great course and online content to supplement training." "Instructor was very impressive, helpful, and thorough in his ability to answer questions." "A great amount of material covered over 3 days." "Comprehensive course—covers all the details, etc. Not just simple projections but includes all the details to build a complete and sophisticated model." "The course enhances different skills, mainly benefits anyone in the financial sector." "Very practical, with a focus on actively building a model. Loved the discussion on how this all worked in the real world." "Brad was a great instructor and very knowledgeable. I would recommend this training not just theory but actual practice building models in Excel." "Enjoyed the sessions, massive thank you to Brad for making it enjoyable at the same time as informative." "Great addition for people looking to enter the industry; solid explanations of common industry practices." "Very relevant, practical knowledge, refines skills applicable to work and university." "Phenomenal instructor that Brad is. He breaks down accounting and finance theories in was that not many accounting professors I’ve had can even come close too. Also love the way he talks about alternate approaches." "Fills a real gap not covered at university, and required for most entry-level banking positions." "Silab is incredibly knowledgeable and very good at teaching." "It is very thorough, the templates are great, and most importantly the instructor is fantastic. Also, the online access is a great benefit." "Fantastic course, very relevant; very well laid out and taught." "Interesting and educational, even if not applicable to current job position." "I would recommend this training because it does a great job of focusing on the fundamental skillsets needed to be an analyst. It also provides relevant real-world examples." "Very well organized, good materials, and excellent instructor." "Creates a basic knowledge foundation that is wide spread." "Great course to take while taking levels 1 or 2 of CFA program. Good at seeing visually how the concepts work in real life examples." "Good overall view into financial statement modeling and valuation. Allows for additional education via online materials." "Silab did an outstanding job of explaining the materials, he is a phenomenal teacher." "Great to take a step back and remember the fundamentals behind what we are doing for work." "Very hands on and helped to de-mystify modeling; good online resources to prepare in advance." "Easy to follow and understand. Really enjoyed it and found it useful." "Good value and useful. Presenter was much more engaging compared to other trainings." "Good start for financial modeling." "Good knowledgeable instructor, relevant materials, good networking opportunity." "Great exercises, modeling techniques, and explanations." "Very informative, concise and clearly communicated." "Jeff was great, answered questions thoroughly. NAV lesson was great." "Highly informative and hands-on learning. One of the better trainings I’ve had throughout my career." "Good models and class materials." "Fantastic job on the class; learning about what the instructor’s real life experiences is what engages me in class." "Great use of 3 days! Helpful, immediately applicable info that was presented very clearly! Really enjoyed the past 3 days and learned a lot." "Comprehensive and passionate teacher. This was a very developed program!" "Awesome templates and exercises on data visualization. Comprehensive overview of modeling, data visualization, and concepts." "Very practical and applicable to day to day operations." "I liked the training a lot, very good examples presented that I can use to apply in my current job. I found this class very beneficial." "It’s good to know and a great follow up to the modeling course. Really enjoyed the real-life examples." "I thought this was a great course. Very interesting and helpful." "I would recommend because it helped fill in Excel Blank spots and gave me ideas of how to build models." "The training was an awesome comprehensive Excel course. Useful information to all professionals in any industry." "This course provides great examples and hands-on experience from a very knowledgeable instructor." "Carl was extremely knowledgeable and did a great job balancing the technical parts of the training with real-life scenarios on how the tools would be applicable in the real world." "Extremely applicable for anyone in FP&A." "Provided very useful tools, lessons, shortcuts and information on model building. Very detailed yet comprehensive. Excellent course, I learned a lot." "I like the Excel model samples we received, they will be a good reference in the future." "Yes, great refresher and I learned more about Excel." "Carl is a talented presenter and did a good job of keeping us engaged with real life examples and stories. The example files will be awesome to have for future use." "This training has provided the needed skills to complement knowledge/experience that I have in the areas of finance/accounting." "The materials were excellent as was the teaching and sharing. Fun and interesting too! I loved it and leave with many helpful take-aways that I will work to develop and implement through our Finance and Accounting team." "Very informative and helps understand crucial ways to be efficient when modeling." "I would recommend this training because very helpful and applicable." "Great material provided, plus all the extra trainings available online." "Learned a lot of best practices." "Does an excellent job of building one thing off the previous exercise. Shows the interconnectivity of the model components very well." "Training is both basic enough to be understood with ‘limited industry knowledge’, but advanced enough to be useful." "The class as well as online courses are efficient and concise. 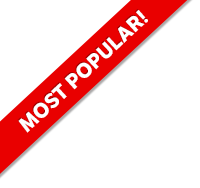 Jeff makes what could be a very dull topic and includes humor and personality; most entertaining Excel course yet!" "Very interesting and I learned a ton." "Valuable skills in Excel and modeling. Great materials—in person and online." "Great course, and Hannah was great. Great way to understand how a model works as opposed to my current role where our model is a template and inputs are just entered." "Good real-world concepts. Having an ex-banker and business owner run the class is much more beneficial than typical ‘text book’ type classes." "Very helpful with getting better at Excel, that is improving efficiency in Excel." "I Would recommend because most of the data was already completed so we could focus on concepts and tying data points together and writing formulas." "It was a great class." "Learned a lot, Hannah was great!" "Thorough, yet concise. Extremely understandable and accurate presentation of complex ideas and concepts." "Great overview of theory and practice." "Very useful and interesting learning and resources. Loved all the Excel tips, find those extremely useful." "I’ve taken one other financial modeling course, and this was significantly better. Fantastic instructor." "In depth. Instructor was good, explanations were thorough." "High quality, and competent instructor." "Excellent course, Haseeb teaches with great balance." "Fantastic teaching style and information and Haseeb was always checking with students that they are understanding and absorbing the information." "Haseeb was very detailed oriented and kept a good pace. Very knowledgeable about investment and could connect academic to real world." "Good fundamentals to have for any finance professionals." "Training is very comprehensive, with excellent examples and good overview of the process." "Hands-on, allowed students to provide feedback and personal experiences, and can be applied to the real world." "Excellent, enjoy the online materials as well for back-up." "I would recommend to people in college or beginning their careers." "Very applicable. While we talk through definitions and higher-level material, we also dive into applying the definitions to examples and Excel." "This was a great course I would highly recommend this class." "Relevant information for anyone in finance, learned useful Excel tricks." "Great, quick way to gain an understanding of concepts." "Very practical, concise, valuable info." "Great crash course in financial modeling." "You get practical training that you do not get in college. A lot of interviews are based on this information." "Industry specific, relevant examples, material is exactly what I was hoping for, very consistent to description." "The course if very good for intended purpose. Would recommend to someone very motivated." "Instructor and course provided great insight and a lot of detail in a few days. Excel practice was great and applicable for many positions." "It greatly improves both core knowledge of the topics and the modeling skills." "This course provides relevant, replicable, and comprehensive models applicable across many industries. I feel that many can benefit from the lecture and materials." "I began this course with knowledge of the topics we covered, but no real application. Now, I feel comfortable conducting my own analysis while referring back to training materials." "Super helpful on Excel, accounting and finance refresher, as well as modeling." "Very useful, focused, and expertly executed." "I would recommended it helps solidify DCF, FSM, M&A modeling knowledge." "This training was great, and I look forward to taking advantage of more online courses and webinars." "Haseeb was very competent and a great resource. Would definitely recommend!" "Haseeb was very engaging and had practical experience." "Great instructor and I learned a lot. Also, a good opportunity to network." "The courses offer a lot of good information to know while in the field of finance." "Very thorough coursework that relates real world best practices and scenarios in an easy to follow format." "Good material and very knowledgeable." "I would especially recommend to people early in their career, good content for the price." "Great hands-on approach and practical." "I think the info and material provided are great for anyone in banking." "Great experience, good pace and practical." "It packs a ton of useful information into a short time period." "Good, quick way to get necessary info." "Covers the basics of many valuable valuations." "It provides a very good education on valuation that will give you the tools necessary to dive deeper." "Good foundation, well explained. Good use of Excel." "Provides crucial knowledge for success in finance field. This info is not covered in detail in school." "Great start to expand knowledge base all-around." "Builds an excellent foundation in financial modeling." "The instructor presented great examples and the material was very high quality and in-depth, especially for just a few days of training." "Great fundamentals and the best practice for building financial models." "Great coverage of a variety of topics. Not too detailed but just enough to be able to effectively apply the knowledge to the real world." "Covers industry-standard topics and encourages application through hands-on exercises." "Very practical application of common corporate finance issues." "Very good course materials and hands-on modeling experience." "Fantastic course – relevant to any financial work." "Kathy was very helpful. The excel shortcuts handouts are very useful. I’m also excited to have access to online materials even after the course is over." "This was a great refresher course for anyone looking to build financial models or wanting knowledge and hands-on experience." "Very helpful in gaining an understanding of financial services industry." "The instructor was great – very knowledgeable." "Great learning materials and added online webinars." "Even as a student with no background in finance – I was able to learn a ton." "Great reference materials that will defiantly come in handy. The instructors were knowledgeable and experienced." "Great instructors and hands-on learning." "Very passionate and enthusiastic instructor. Although there are some high-level materials involved, basic core knowledge is also covered." "Real world examples at a great pace." "The instructor was knowledgeable, helpful, and approachable." "Very good applicable training. The course made a lot of topics I learned in school more relevant." "Instructor did a great job explaining the material, not just reading it from the slides." "The course uses real life examples and includes lots on great materials." "Extremely helpful course – combination of teacher and the examples made it easy to follow and excellent to learn from." "Great course, super educational and good application practice." "The training had a great pace and was both engaging and informative. The accompanying examples and videos were well done." "This training is a great bridge between school and work. It provides a lot of skills that help you be more efficient and get the job done." "Awesome videos to supplement the in-class teaching." "The material was very relevant to real work and presented in a way that is easy to understand." "It is a great way to truly understand financial modeling from the first principles all the way to the advanced ones." "The course was very well organized and will help me improve the clarity and functionality of all my models." "Excellent tools to walk away with a foundational understanding of what to look for in a deal and true methodology on how to do IB work." "Very illuminating, I am smarter for having invested the time." "Great coverage of all the topics along with examples to follow up that help you learn." "The instructor did very well and made sure that everyone understood the material and was on the same page." "Great intro to modeling and other IB topics." "Great hands-on practice in modeling." "I learned a lot of skills and tricks that I know will be real-world applicable." "I learned more accounting in 3 days than I did in 4 years of college." "Fantastic explanation of the content, and Silab’s real-world experience helped greatly." "The instructor was very effective and moved at a good pace. The material was very comprehensive." "Great balance of theory and technical application, very hands on." "The course drastically increased my comfort level creating financial models and also building familiarity with excel." "Very useful for anyone in the finance industry." "Well structured and the instructor did a great job breaking down complicated material." "Helped my financial modeling skills tremendously." "Instructor was great and very knowledgeable." "Very well presented and a knowledgeable instructor. Included a lot of useful excel tips as well." "Very useful for anyone in banking, private equity, or accounting and finance." "Great course for anyone who wants to improve their valuation and modeling skills." "Very thorough, great content, nice examples used and very relevant material that was laid out in a way that was easy to follow." "Great learning experience and useful online materials as well." "Excellent training on financial modeling and excel." "Great materials with lots of things that I will be able to reference later." "Very organized compact format with lots of useful materials." "A very thorough and clear course." "Topics with focus on both intuition and understanding of concepts, and lots of valuable hands on practice. The whole course was and will be a huge help in all areas." "Very educational and helpful. The case studies were especially well prepared." "Great overview of FSM, DCF, M&A and much more!" "This training was very beneficial. I learned so many things within 3 days. Very interactive and knowledgeable instructor." "The instructor was very knowledgeable, and had a good sense of humor. He engaged the class well throughout and the material and exercises were well organized and understandable." "Lots of applicable info in a short amount of time." "This course is a great primer for getting started and refreshed in modeling and IB concepts." "Great preparation and hands-on training." "Great materials and a great instructor!" "Especially relevant and a good hands-on experience." "It was a great insightful training. I was able to form a much better understanding of the topics." "Well explained in great detail, and the information I learned can be renewed later." "The access to materials post-course helps with review and further practice." "Between the incredible instructor and the online resources, the course was great." "Overall it was excellent, engaging and one of my favorite instructors I’ve had! Super useful way to start off a career in this space." "Very good, thorough, well-paced course, really like the fact that the professor moves at a manageable pace." "Course is thorough and provides a good foundation of financial concepts and tools needed in practice. Silab was an excellent instructor. His ability to go into more detail on numerous topics was a definitely plus for the course." "The kkills taught are highly important for valuing and analyzing different aspects in finance. Exceeded my expectations." "The materials and information are very informative and easy to understand." "The pre-class material and the in-class Excel work was well laid out and very conducive to my learning style." "This was very helpful to review financial modeling. I have a much better understanding and have become more efficient using Excel to create models." "Taught me tips and tricks I did not know and would not have learned otherwise. Silab is extensively knowledgeable on these topics." "I would recommend this course because Wall Street Prep provides all material and free access to all the material for a lifetime." "It was a helpful training session for finance field guys and I will definitely refer my company colleagues for subject training. This course was more comprehensive and has covered key financial areas." "I would recommend this to people who want to gain theoretical and practical knowledge in finance and accounting. Great materials and useful webinars." "Delivery and material are great." "Very thorough and detailed, instructor is more than qualified and info is applicable to people of all finance backgrounds." "Great topics to know, high level yet complex. Great teacher, great course." "Instructor was extremely knowledgeable; materials were easy to follow." "Helpful in many different ways. Helped to understand topics on a deeper level. Helped with understanding ‘why’." "This is great for people at the beginning of their careers or looking to transition." "I believe this course connects dots in a manner that is not what you would get in a classroom setting. Mr. Mohanty did an excellent job in bridging the gap between academic and real world applications." "Very detailed and applicable to my line of work." "Good link between school and the real world." "Clearly explained concepts and very helpful to learn how to actually build financial models." "Very concise and structured, Brad is very clear and passionate about teaching." "Very extensive and well explained, it would take weeks to learn this on my own. Really liked the small size of the group." "I found the training very insightful, lots of the topics covered are applicable to my daily job routine." "Very relevant to those who want to pursue a career in finance." "I would highly recommend this training to others as it provides real, practical hands on experience with modeling and valuation. Anyone that learns best through lecture style, hands-on training, would highly benefit from this course." 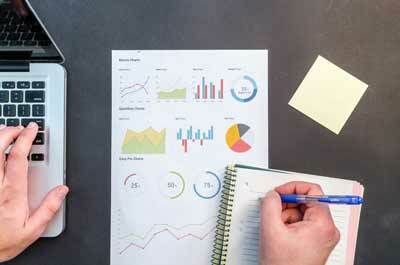 "The course contained a lot of relevant information for valuations, and there was a lot of Excel tips that are applicable in any spreadsheet analysis. Jeff was a great instructor, very knowledgeable and friendly." "This course was much better than other trainings I’ve taken." "Jeff is an excellent presenter, good at communicating and is obviously knowledgeable." "Interesting material, fun instructor, overall good experience." "Good basic financial modeling class and excellent modeling templates." "Solid and concise overview of modeling." "Very practical, very well set up. Easy to follow along, very useful in teaching best practice and how to logically set up a model. Great instructor who really knew his stuff." "Very useful overview of financial modeling with good supporting resources online. Silab was a great instructor, he was very knowledgeable and made it easy to understand concepts." "Best modeling course I’ve taken. Silab was very thorough and offered many examples. Exceeded all of my expectations." "Great instructor, ability to access training videos thereafter important and valuable." "Training is an excellent crash course in finance and accounting. Has given me a lot of useful modeling best practices and a solid refresher on M&A concepts." "It covers a wide range of topics quickly and is beneficial for people who need to learn in a short amount of time." "Great videos and webinars for after the training." "Highly relevant material that gives you real world application in a classroom environment." "Great as both a refresher and intro to new concepts." "Good info, great continuous model." "Very useful for future bankers and students interested in corporate finance." "This helped build a great foundation for modeling. I can better relate to our business development group and help in building out assumptions. Significantly more hands on than other trainings I’ve been to, which is much appreciated." "If your job currently required Financial Valuation Modeling, this is an excellent way to improve upon or refresh your skills." "Great instructor, very applicable. Excellent translation of complex ideas and thought processes into easy to follow and digestible examples." "It’s helpful to understand how interconnected line items are in modeling. Silab was an excellent teacher, really clear and answered all questions." "Silab made it really easy to understand, his perspectives from industry experience are also invaluable. I would come back for any other course that he teaches." "Silab was engaging and incredibly smart, he was easy to listen to and took time to make sure we understood." "Information is highly relevant and the instructor is an expert in his field." "Very helpful as a refresher for experienced professionals. Silab does an excellent job in explaining the conceptual stuff which is extremely helpful." "It’s comprehensive and the basis for any modeling in finance." "Very helpful materials/overview. The ‘real-life’ examples are particularly helpful in understanding the information." "Very technical info – useful to relevant finance jobs." "Excellent, lots of good info." "Good overview of oil and gas modeling." "Excellent Excel and modeling tips as well as accounting overview." "Very thorough and liked the Excel shortcuts. This was more hands on than other trainings, I liked that and the examples." "Very interactive, lots of practice exercises that are beneficial to job related work." "Hands on, step-by-step instruction, knowledge on valuation and modeling." "Covers a wide basis for financial modeling." "Very hands on, helpful and applicable, better than other trainings." "Really applicable to Oil & Gas, structures modeling well and gives a solid base for building models." "Very well put together, wide coverage of topics." "Very detailed, goes over the material in a very informative way." "Good review and starting point for further learning. Friendly, constructive atmosphere." "Very well taught and easy to understand." "Good wide base of information and introduction to financial modeling." "It has good practical applications." "Loved the 3-day layout of course and flow from 3-statement model building to DCF and M&A." "I thought it was a great way to get acclimated to financial modeling, I feel like I know way more than I did. I also feel like the online classes are a great resource. Way better than other trainings, a lot more in-depth and helpful, also a way better teacher!" "Professor is top notch! Excellent experience. Much more in depth than other trainings." "Great online and in-class modeling exercises. Instructor was very knowledgeable and a great presenter. Really enjoyed the in-class Excel exercises." "Knowledgeable and patient instructor, good location and support." "Accelerated, practical and the instructor did a fantastic job of explaining the underpinnings of the concepts, the contexts in which they are used and made the content accessible regardless of accounting or Excel skill level." "Very informative and hands-on. Provides a good amount of theory to go along with the actual exercises. Overall, very happy with the training and feel I have the tools now to be much more effective in my role." "This session is quite excellent for the people who are preparing to work or just wanting to have some experience in finance." "Material is well presented and a thorough walk through of what is important to succeed in modeling. Great program, will be recommending it to others." "Class was fast paced, but a lot of information presented in a clear/concise matter and worksheets were helpful." "Yes, would recommend. Very good." "Presenter did a good job." "Great foundation to learn modeling and valuation." "It was a great opportunity to build my skills. Mike was great, he made the topics easy to understand and offered story insights." "I would recommend the training its thorough and applicable. Great instructor." "The material is great and instructor is engaging and smart/knowledgeable." Wall Street Prep boot camps are intensive seminars that bridge the gap between academic training and real-world job expectations. They deliver practical skills that will set you apart in interviews and on the job. Our live courses pulls no punches. Each boot camp is the same intensive training used to prepare incoming analysts at top financial institutions. Attendees “learn by doing” by working through practical exercises and building financial models from scratch using real case studies. Boot camps provide an opportunity to network with MBAs and professionals from industries including investment banking, corp dev and FP&A. Our instructor-practitioners are experienced bankers who give real-world context by connecting training to their own experience on the desk. Our training reinforces speed, efficiency and consistency in Excel that investment banking analysts are expected to have on Day 1. Enrollment includes lifetime access to our continuing education online training platform and our popular monthly webinar series.